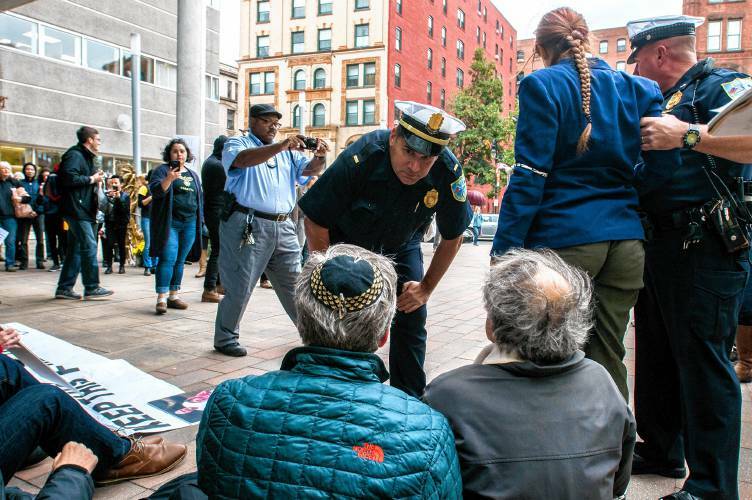 Photo Courtesy of gazettenet.com || Last week 18 Hampshire County residents were arrested for protesting the deportation of local Luicio Perez. Last week in Springfield, 18 Hampshire County residents were arrested at the Department of Homeland Security’s regional office while protesting the deportation of an undocumented resident of the county. The demonstrators were reportedly blocking the front entrance and restricting access to the building. Amongst the 150 people gathered were residents from Amherst, Northampton and Hadley. While undocumented citizens like Perez would not normally be a high priority for deportation because of their clean records, Trump-era policies have led to a crackdown and increase in these types of deportations. Those who protested included college students, both undocumented immigrants themselves and children of documented immigrants, religious figures and other county residents. The Springfield police reports write that the 18 individuals arrested were blocking access to the building and refused to vacate the space. This incident is only one of many that have greatly affected those living in the country as undocumented immigrants through the Trump Administration. At the time of reporting, a teenage immigrant girl who came to the country without her parents successfully petitioned to receive an abortion, but the decision has now been stayed, according to CNN. Living in a detention center, the young woman awaits perhaps both forced childbirth as well as deportation. Various advocacy groups have sought funding and support to defend the teenager’s rights and to create a greater statement about the rights of immigrants in the United States. Smith College, as well as other college campuses, have also felt the impact of Trump’s immigration policies. Earlier this year, The Sophian reported on both the threats made to end the DACA, or Deferred Action for Childhood Arrivals, program and the U.S. Customs and Border Protection Agency’s decision to not attend Smith College’s Fall Career Fair. “We will stand with our students during this time,” McCartney added. The Border Protection Agency’s decision was made while a petition, written by students, in protest of their presence was addressed to the Lazarus Center. The petition requested that Smith disinvite the U.S. Customs and Border Protection Agency (CPB) because of their policies and treatment towards undocumented immigrants. The petition ultimately received 900 signatures from the Smith community. Organizers of the petition were explicit that the college was not the driving force in the CBP’s choice to not attend the career fair. As Trump-era policies continue to target even the most vulnerable undocumented immigrants, Smith College and the larger community of Hampshire County have demonstrated a fervency to defend those who at times are unable defend themselves.